If you're like me, you've at least thought about tackling a reupholstering job. There are so many inspiring before and afters out there. It's just a matter of time before I try it myself. I've got the heavy duty staple gun. Now I just need to find one of those fabulous chairs by the side of the road that everyone seems to be spotting, except me. Flea markets and second hand stores in Japan don't offer as many options as the American ones, but I've been keeping my eyes open. The other thing I'll need is fabric. But how much? Well, I found this site called Warehouse Fabrics that has this nifty little chart along with tons of discount fabric. I've never ordered from them, but the chart is very useful. There are pictures of just about any type of seating you can imagine with an estimate for how much fabric you need. There's also a slipcover chart. Shocker! I had no idea I'd need 18 yards for a 3 cushion sofa. No wonder my sofa slipcover is a little snug. So I guess before I get excited about how much money I'll save with this DIY project, I ought to calculate fabric costs first. Plus, the batting and foam costs. Even if it's not a super cheap way to go, it would still be fun to have a custom upholstered chair, don't you think? 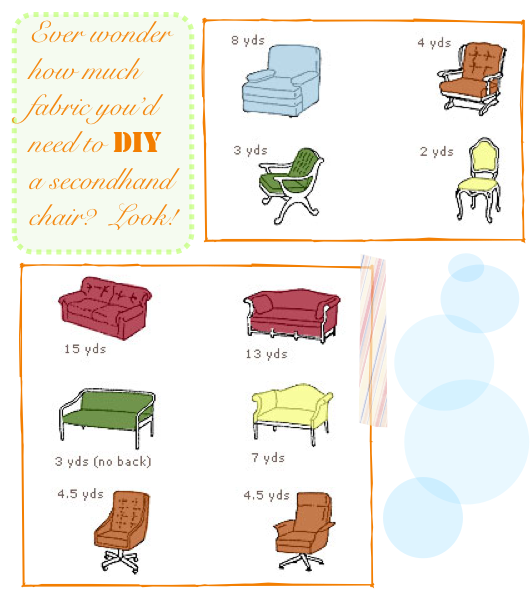 Chair illustrations and yardage info via Warehouse Fabrics.